When, on October 11th, 1899, shortly before 5 o'clock in the afternoon, martial law was proclaimed throughout the Transvaal and Orange Free State, South Africa, and after the great exodus of British subjects had taken place, there remained in Pretoria, where the principal events recorded here took place, a harmonious community of Boers and sympathisers, who for eight months enjoyed the novel advantage of Boer freedom under Boer martial law. The remaining English residents were few in number, and kept, to all appearance, "strictly neutral," until the morning of June 5th, 1900, when the British troops poured into the capital. The two people chiefly concerned in this story, mother and daughter, lived in Sunnyside, a south-eastern suburb of Pretoria, on a large and beautiful old property, appropriately called Harmony, one of the oldest estates in the capital. This historical place consisted of a simple, comfortable farm-house, with a rambling garden—a romantic spot, and an ideal setting for the adventures and enterprises here recorded. 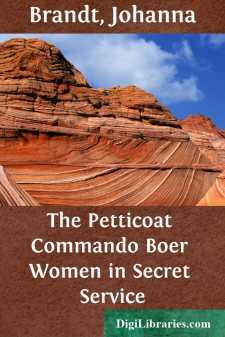 At the time our story opens, the owner, Mrs. van Warmelo, was living alone on it with her daughter, Hansie, a girl of twenty-two, the diarist referred to in the Introduction. The other members of the family, though they took no part in those events of the war which took place within the capital, were so closely connected with the principal figures in this book that their introduction will be necessary here. The family consisted of five, two daughters and three sons. The elder daughter was married and was living at Wynberg near Cape Town, the younger, as we have seen, was with her mother in Pretoria during the war, while of the sons, two, the eldest and the youngest, Dietlof and Fritz, were on commando, having left the capital with the first contingent of volunteers on September 28th. The third brother, Willem, who had been studying in Holland when the war broke out, had, with his mother's knowledge and permission, given up his nearly completed studies and had come to South Africa, to take part in the deadly struggle in which his fellow-countrymen were engaged. In order to achieve his purpose, he had taken the only route open to him, the eastern route through Delagoa Bay, and had joined his brothers in the field, after a brief sojourn with his mother and sister at Harmony. Considering the circumstances under which he had joined the Boer forces and the sacrifice he had made for love of fatherland, it was particularly sad that he should have been made a prisoner at the last great fight at the Tugela, the battle of Pieter's Height in Natal, on February 27th, after a very short experience of commando life.